Forget it, I solved alone! I read through the madVR section, it really is very well done, but I do have a few corrections and a comment. Force inverse telecine (IVTC). This is allows interlacing of any content madVR detects as 24/25p, even if it is incorrectly flagged as a video source. This can be useful with PAL DVDs. This should probably be something like "Force inverse telecine (IVTC). This is forces madVR's inverse telecine to recover the original progressive frames on any content madVR detects as 24/25p, even if it is incorrectly flagged as a video source. This can be useful with PAL DVDs." madVR can also detect more types of telecining but you might not need to get into the details of that. Is it really useful for PAL DVDs? I though most PAL DVD film conversions were sped up instead of telecined? A very common form of telecining is NTSC, 24 fps film stored as 30 frames per second interlaced. Force DXVA interlacing, which uses the GPU’s interlacing as set in its drivers. This should be "Force DXVA deinterlacing, which uses the GPU’s deinterlacing as set in its drivers." This description of what debanding fade detection does is wrong. Because madVR cannot tell if it is a fade before it renders five frames it has to re-render them using the higher debanding strength when it detects a fade (if it wants to render them using the higher strength). This way every frame that is detected as part of the fade can be rendered using the higher debanding strength. This is only important because it results in five frames being removed from the render queue which might cause a dropped frame when using a small queue depth and/or running close to the limit of the GPU. (2014-11-23, 09:32)Warner306 Wrote: Most video is stored using chroma subsampling in a 4:2:0 video format. In simple terms, what this means is that the video is basically stored as a black-and-white “detail” image (luma) with a lower resolution “color” image (chroma) layered on top. This works because the detail image helps to mask the low resolution of the color image that is being layered on top. This is wrong in nearly every particular but it gets the point across almost perfectly without needing to explain how humans see color, complex matrix math, and the historical methods for broadcast TV that I am not sure that matters. A useful lie. (2015-10-05, 06:54)Asmodian Wrote: Excellent Guide! I read through the madVR section, it really is very well done, but I do have one correction and comment. This technical information came from another thread. You will have to visit the Doom9 forums and ask in the madVR thread if you disagree. I can follow a response there but think it is already accurate. i need to discuss about settings for MadVr, not too technical aspect cause i'm not a specialist. My first need is related to configure correctly madvr, considering my htpc! Smile Thank you!! The complexity of MPC-HC set-up can be intimidating for novice users. However, correct configuration is nothing more than following a series of set-up screens with checkboxes. Realistically, this can be completed in an hour or two. If you are at all familiar home theater set-up, these settings will be less than intimidating. *You must install the 32-bit version of MPC-HC if you plan to use ReClock. *To install madVR, extract the zip file to the Program Files directory and run the "install.bat." *Install the link XySubFilter Beta3 .zip Archive (32-bit if using ReClock). To install XySubFilter, extract to Program Files, right-click "Install_XySubFilter.bat" and select "Run as Administrator." The inspiration for this guide came from the original AVS Forum post from 2011. Most technical set-up from that post has been incorporated in this guide along with supplemental information for each program. It is not required reading, but the Advanced Setup Guide is still recommended for those interested in MPC-HC and its supporting software. As a companion to JRiver Media Center, the Expert Guide is a professional guide that deals exclusively with using madVR as a video renderer. Regardless of video player used, this step-by-step tutorial should be used to configure madVR after reading the introduction to Section 4. Screen-by-screen instructions along with technical explanations for each option make this the best madVR set-up guide on the Internet. The final code snippet defines file compatibility with the new player. MPC-HC can be designated as the default player for all videos (video="true"). However, this would conflict with the proper playback of video add-ons containing Internet streams. By default, Internet streams of any kind are not compatible with use of MPC-HC as an external player and should be left to DVDPlayer. 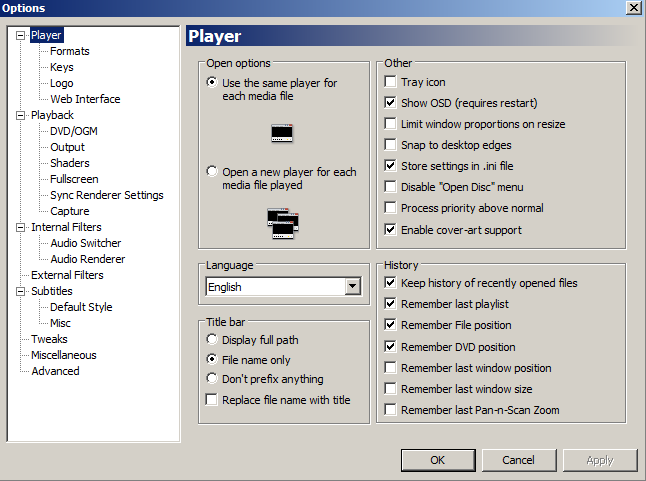 Setting video to "true" and defining MPC-HC as the default player and setting DVDPlayer as the player for Internet streams is a an alternate way of dividing content between the two players. This eliminates the need to define every file format that is compatible with MPC-HC. Although, if this method is used, some stubborn streaming content will erroneously open with MPC. That makes format #1 the preferred choice. Launcher4Kodi Users: You must specify all external players in the program and set each to "Focus External Player" in the "External Players" tab to avoid losing mouse focus during playback. I am definately interested in doing this with Plex. Can someone explain exactly what needs to be installed and what config changes need to be made? This is a great solution for people who are not crazy about the built in Plex player. Also, the ability to play ISO would be awesome. (2015-12-03, 16:00)Concestly Wrote: I am definately interested in doing this with Plex. Can someone explain exactly what needs to be installed and what config changes need to be made? This is a great solution for people who are not crazy about the built in Plex player. Also, the ability to play ISO would be awesome. Just installed Kodi yesterday and it's running nicely. I'm trying to get MPC-HC working as an external player, but I've run into a very strange problem. I followed the directions pertaining to the playercorefactory.xml file, and I simply copied and pasted it exactly with the only change being the addition of " (x86)" to the Program Files directory (I am using the 32-bit MPC-HC). This works flawlessly for movies, but not for TV shows. I simply have TV episode encodes filed under TV within Kodi, and they are using the same container as my movies (MKV). When I try to watch a TV episode, the screen goes black and I briefly see the MPC-HC interface, like I do when I open a movie, but the screen stays black for a few seconds before going to the desktop. Kodi is minimized at this time, MPC-HC is no longer running, and I cannot bring Kodi back up by clicking it in the taskbar; I have to manually shut the process down and re-launch the program. Here are two logs, one from when I start a movie and the other from when I start a TV episode. I've cut out everything except the actual events. Let me know if you need the full logs. I tried messing around with it and nothing works. One funny thing is if I use the simplified version (the one which simply defaults all video to MPC-HC and does not have the filetypes/protocols lines), all videos open in Kodi's internal player. 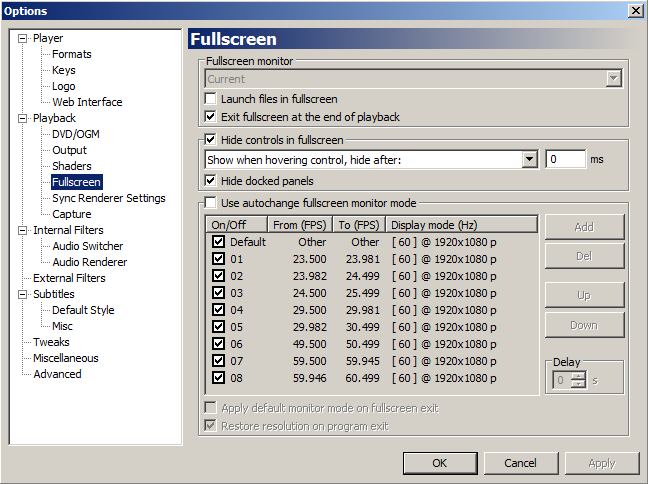 Here are my MPC-HC settings for Player and Fullscreen. I also tried toggling most of these settings with no luck. I'm flabbergasted. The fact that this only happens to my TV episodes has me scratching my head, especially considering they're the same file types as my movies. I really can't think of a reason why this would be happening, unless Kodi handles video files in the TV group differently than it does video files in the Movies group. (2016-01-24, 19:21)snoopy7548 Wrote: Just installed Kodi yesterday and it's running nicely. I'm trying to get MPC-HC working as an external player, but I've run into a very strange problem. This is a tough one. I would post this in the Windows support forum. Team Kodi members and other technical experts are more likely to respond. I am assuming these files play with the default Kodi player? Otherwise, it would be the TV show files at fault. The only other explanation I can think of is that the file system cannot be read by MPC-HC. Are these shows on the same hard drive as the movies? Do these files work when played with MPC-HC outside of Kodi? Are you using refresh rate switching with madVR? (2016-01-25, 03:57)Warner306 Wrote: This is a tough one. I would post this in the Windows support forum. Team Kodi members and other technical experts are more likely to respond. Thanks, I'll post over there later today. Yep, all files play fine when I'm using the Kodi player. I have all of my movies and TV shows spread out over two hard drives, but the specific files I tested were on the same harddrive. I've tested files from both hard drives and they all play fine with the default Kodi player. Using just MPC-HC by itself, I have zero problems playing all of my files. I am using MadVR to switch between 23 and 60Hz, when necessary. I am also using ReClock. Both of the files I tested were 24fps (or 23.976Hz). It's fixed now! pagali encountered the same problem and discovered it was the "Nextup TV Episode" script causing the problem, but on mine it was the "Nextup Service Notification" which was enabled when I installed Aeon MQ6. I disabled it and everything is working fine now. Yes, the Nextup Service Notification addon (or script) is what I meant. I am running Kodi under Windows 10 Pro 64 bit and I have installed MPC-HC 64 bit. For some reason I can't get MPC-HC running when I press play on Kodi. (2016-01-29, 18:19)Cr4z33 Wrote: I am running Kodi under Windows 10 Pro 64 bit and I have installed MPC-HC 64 bit. I seemed to have the same problem. Explicitly stating the file types to be played by MPC-HC fixed it for me. I'm using the following code, copied from the first post. Note it includes the <playcountminimumtime>1140</playcountminimumtime> line which is used to set videos to "Watched" after 19 minutes of play time. Thanks now MPC-HC is loading, but I always get an error in its window saying 'Cannot render the file'. If I play a video directly from MPC-HC everything is OK. Anything to do with the fact the videos are stored in a NAS?